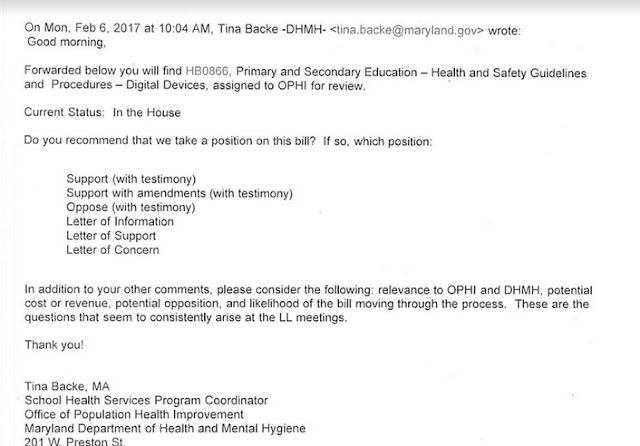 It's disturbing to read the callous questions that health department staffers posed to each other when considering the classroom screen safety legislation that was sponsored by over 25 delegates in the most recent Maryland General Assembly session. 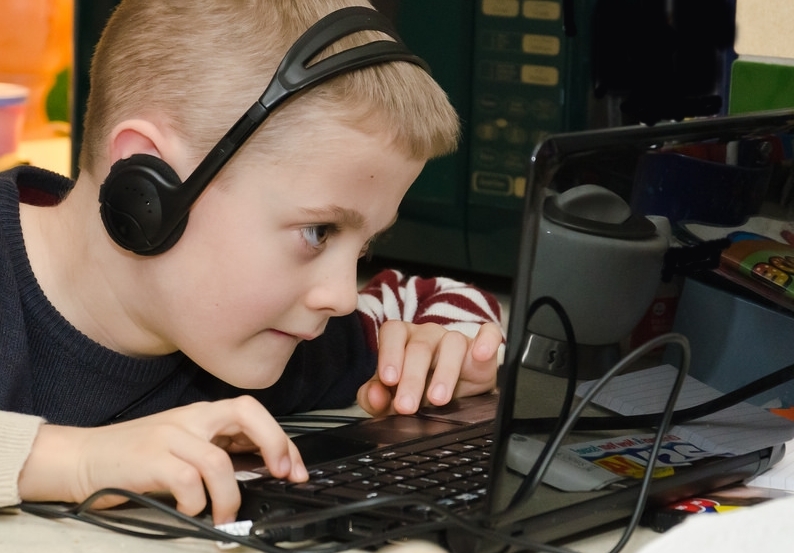 House Bill 866 directed the health department to craft digital device safety and health guidelines that would protect Maryland students from known and avoidable health threats that could permanently damage our children. Ponder that, for a moment. Students are required to use school devices that are known to be hazardous, with no oversight or protection, putting them at unnecessary risk for retinal damage, muscle and joint pain, sleeplessness, obesity, diabetes, anxiety, depression and addiction. More concerns are raised about these devices every day, and have been for decades. The Maryland bill would have protected our kids from avoidable health risks that their schools are imposing on them. This can't be repeated often enough, or loudly enough. 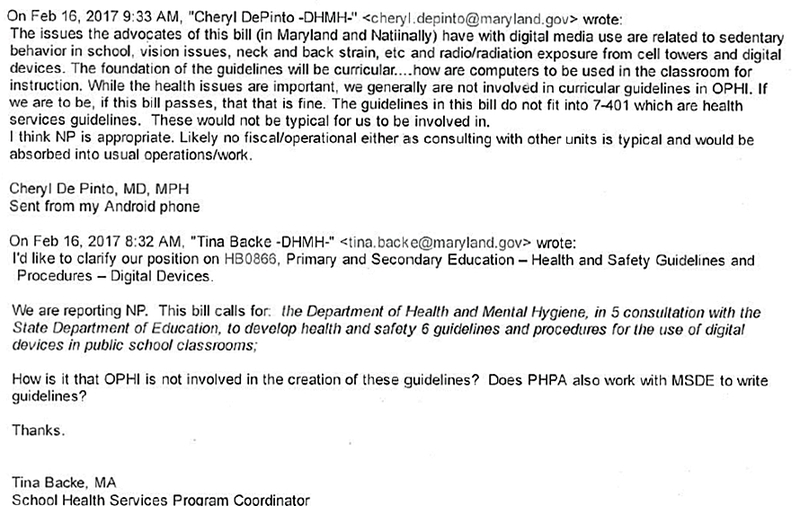 Staff communications obtained through a Public Information Act (PIA) request reveal the attitudes of state health department managers who focused exclusively on their own political advantage, not on our children's health, when considering the MD classroom screen safety legislation. Getting the PIA request documents has been a struggle. They were not provided within the required 30 days. The files were modified -- headers, names of recipients and emails were deleted before the documents were provided. And top staffers have consistently ignored subsequent requests for complete documentation. To understand the emails DHMH has provided so far, a lesson is needed to decipher the units of this bloated department. DHMH stands for Maryland Department of Health and Mental Hygiene. PHPA stands for the Prevention and Health Promotion Agency. Since PHPA is responsible for environmental health issues, some believe PHPA should craft the classroom screen safety guidelines. OPHI stands for Office of Public Health Improvement. The Office of School Health (OSH) is in the OPHI division. Dr. Cheryl De Pinto is the medical director. Tina Backe is the School Health coordinator. NP stands for "No position." And LL stands for legislative liaison. Here is an email from Ms. Backe asking unnamed staff members (the original header on the email was not provided in the PIA documents) to review the digital device safety bill. She instructs them to keep a number of considerations in mind. Any mention whatsoever of our children's health. From the School Health Services Program Coordinator. Not one word. Now read what Dr. De Pinto writes. It's important to realize that she is a pediatrician, which makes her disregard for our children nothing short of chilling. It's astounding that a pediatrician who has written findings on Maryland childhood obesity for the CDC could wash her hands of our children's health so completely and focus her thoughts exclusively on political bureaucracy. Childhood obesity and its relationship to digital media use is an alarm sounded by major health organizations and universities nationwide. This is a public health issue, not a debate about curriculum. Even her own colleague questions her position - look at the original email, below. 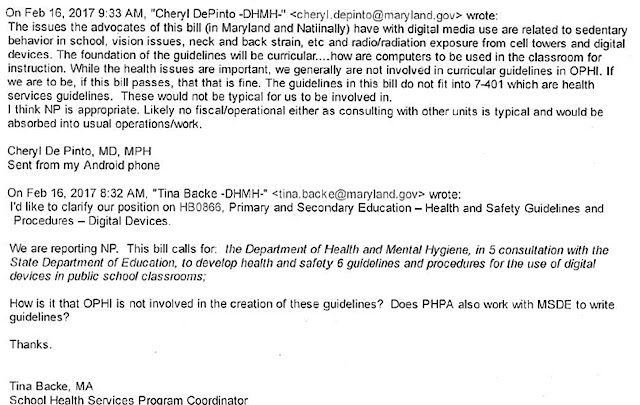 Ms. Backe implies responsibility, and notes that they already write guidelines with the department of education (MSDE). She asks, "How is it that OPHI is not involved in the creation of these guidelines?" The answer to Dr. De Pinto's question came from the Environmental Health Board director. He requested $100,000 in consultation fees in a letter to the fiscal policy analyst reviewing HB866, claiming this bulging health department, replete with experts, needed to hire an outside consultant to craft digital device safety guidelines for Maryland students.